The Canadian Lacrosse League will crown a new champion next week. The defending Creator’s Cup champion Barrie Blizzard were knocked out of contention for the 2016 title after a 13-12 overtime win by the Durham Turfdogs in the semi-finals. The Turfdogs will play for the championship for the first time in the league’s five year history. A thrilling back and forth overtime ended 4:38 into the extra frame when Josh Wasson beat Barrie goaltender Angus Dineley with a sidearm shot from the line that Dineley never even saw. Barrie had taken a 12-11 lead 6:22 into the fourth quarter and had a chance for a two goal lead late in the game when they were awarded a penalty shot as the Turfdogs had too many men on the floor. Caleb Wiles, who had two goals and four assists on the night, took the shot but missed the net. Durham got some quality shots in the latter part of the fourth but had to wait until the last minute of regulation to tie it up. With Coote on the bench for an extra attacker, Derek Hopcroft accepted a hard pass from Dylan Goddard and fired the ball through Dineley’s legs to tie the game at 12. Durham then had the last possession of the fourth quarter and pulled goaltender Lukas Coote but couldn’t get a shot away. Overtime was fifteen minutes of sudden death although it required less than five. The Blizzard out-chanced the Turfdogs but Coote was great when he needed to be, stopping several hard Barrie shots including a point blank save on Mike Teeter on Barrie’s first possession. Dineley also had a great save off McMahon later in the frame. Neither team held more than a two goal lead at any point in the game and neither team was able to go on more than a three goal run as each team’s defense was solid. 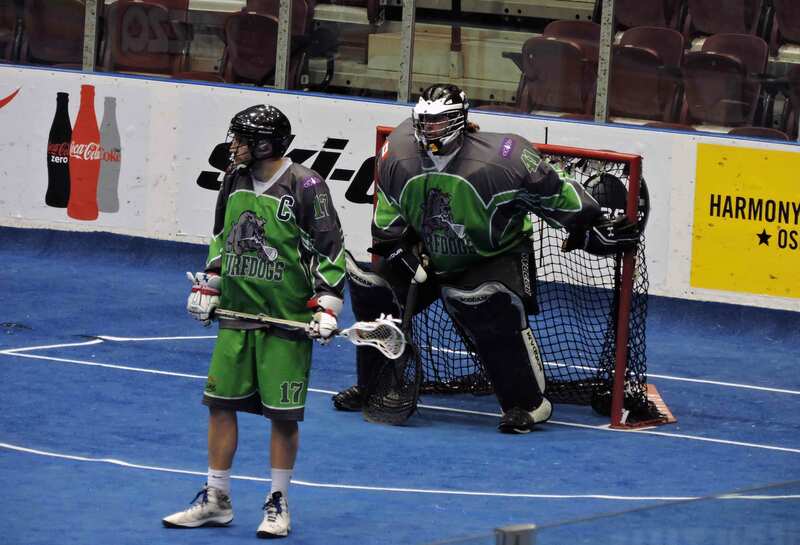 Turfdogs captain Mark Farthing, in particular, played a great game creating havoc for the Blizzard offense. Durham’s best offensive players were at the top of their game, with Cody McMahon scoring two goals and six assists, and Goddard two goals and four assists. The Turfdogs also got a big boost with the return of Thomas Hoggarth, who was recently placed on the Vancouver Stealth’s practice roster, making him eligible to return to CLAX. Hoggarth had two goals in his return. Hopcroft had two goals and two assists, Wasson two and one, Tim Bergin one and one, and Mike Triolo scored once. Dustin Caravello led the Blizzard with three goals and three assists. Brad Levick had two goals. Singles were scored by Teeter, Darryl Robertson, Shane Scott, Tyler Roche, and Mike Mawdsley. Durham will now await the winner of the Niagara Lock Monsters and Ohsweken Demons semi-final. If Niagara wins, they will host the championship game, but if Ohsweken wins, Durham will host. That semi-final game will take place on Sunday afternoon at the Meridian Centre in St. Catharines.